In a deep skillet, heat two turns of the pan of EVOO over medium-high heat. Add chicken and lightly brown, 3 minutes, then add carrots, onion and celery as you chop, then the peas, and season with salt and pepper. Cook for 10-12 minutes to soften. Pre-heat the broiler. Set rack in middle of oven. Bring 1 cup chicken stock and 1/2 cup cream to a boil, then stir in polenta and whisk to mass it, 3 minutes. Turn heat low, stir in Gruyère cheese and reserve. Scoot meat and veggies off to the side in the skillet, then melt the butter and combine with flour for 1 minute. Whisk in the 2 cups remaining stock and combine, then stir in 1/2 cup remaining cream and bring to a bubble. Stir in Dijon mustard and tarragon, adjust salt and pepper, to taste, and transfer to soup bowls. Set soup bowls on a baking dish. 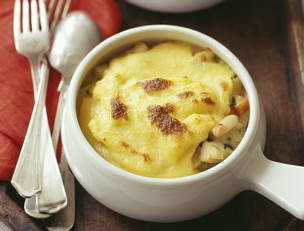 Form tops to your pot pies with the polenta and cheese mixture. Set under broiler and brown for 2-3 minutes. In Recipes-list.com we have selected the most viewed recipes from category - uncategorized . Enjoy the best recipes specially selected for you! Tarragon-Cream Chicken and Polenta Pot Pies is the right choice that will satisfy all your claims.